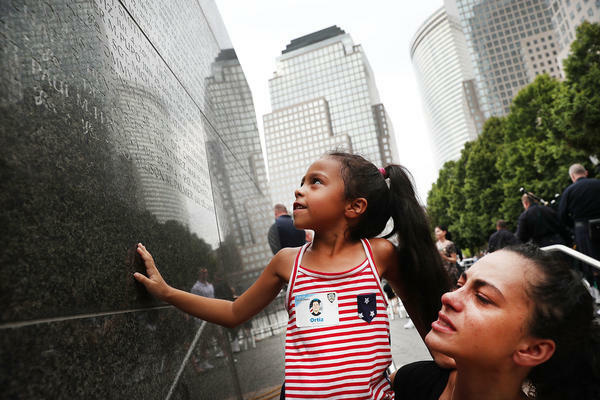 Bernadette Ortiz holds her daughter, Adriana, last year as she looks for the name of her grandfather, New York City Police Officer Edwin Ortiz, at a wall commemorating fallen officers in New York City. Families gathered at the wall following a procession in Lower Manhattan to mark the anniversary of the Sept. 11 attacks and honor officers who were killed. Ask students born after 2001 what they know about the attacks, and many admit they have big knowledge gaps — gaps that they also want filled in. "It was a really big part of other people's lives. I wasn't born then," says Kaylah Eggsware, a seventh-grader at Greenfield Middle School in Greenfield, Mass. "I don't know about it, so I don't know how to feel about it." "I'd like to know exactly, like, everything that happened. Because I don't know exactly how many planes there were," says Josh Sylvester, also a seventh-grader at Greenfield Middle School. "I know the two twin towers fell. But I don't know if anything else happened." Like a lot of middle schools, Greenfield taught little about that day, and none of the "anything else." Often, the school would observe a moment of silence at anniversary time and follow with a brief class discussion. "We have never really tackled the issue before," says Greenfield Principal Gary Tashjian. But that's changing. This school year, Greenfield students, as well as their teachers and administrators, are being asked to read and discuss a new young adult novel called Towers Falling by Jewell Parker Rhodes. The protagonist is a resilient New York City fifth-grader named Dèja. In her new school, the towers were once visible from her classroom. Her family has hit hard times: Her father suffers a host of physical and mental problems related to the attacks. After the family gets evicted, it moves into a homeless shelter. Dèja knows the attacks have cast a shadow over her life, but she doesn't know much about them. So she and her friends set out to discover more. Tashjian hopes the all-school read sparks discussion, debate and further inquiry among students. "They can relate right off the bat to many of the things this girl is going through. Maybe not exactly; maybe I don't have someone who was affected directly by 9/11. But maybe I have a brother who was in Iraq," Tashjian says. "The whole conversation gets a whole lot bigger with something as simple as a book." It's not clear how big that conversation will get at Greenfield. The school is encouraging the entire town to read the novel. "My first reaction was to say, 'No way, can't go there. It's too sensitive and parents will give a lot of pushback,' " says Angela Ruggeri, Greenfield's assistant principal. But she ultimately changed her mind. Issues of terrorism and its aftermath come up on the news all the time, Ruggeri says. "I started wondering, what are the conversations parents are having with their children about this, and how will they approach it?" Teachers hope the book provides jumping-off points for talking about the more difficult issues "beyond the events of that one day to really thinking deeply about what it means to them to be an American citizen," says Ashley Fitzroy, a literacy and technology teacher at the school. The middle school is something of an outlier nationally for starting a schoolwide conversation. The majority of schools that do "go there" often focus on the shock and horror of the attacks and the heroism of the first responders. "The narrative about 9/11 that students are getting is really ahistorical," says Cheryl Duckworth. "It has no context. It's very thin." Duckworth surveyed more than 150 teachers and interviewed several dozen in-depth for her work 9/11 and Collective Memory in US Classrooms. Duckworth, a professor of conflict resolution at Florida's Nova Southeastern University, found that only about 20 states include content about Sept. 11 in their high school social studies curriculum. And in about half of those states, she says, the topic is covered in a mostly cursory way. A 2011 research paper by the Center for Information & Research on Civic Learning and Engagement underscored serious shortcomings in Sept.11 teaching curricula, including textbooks with "a startling lack of detail about what actually happened on 9/11." In addition, the report found that despite the many contentious issues surrounding the attacks and the American response, "little was presented in the early curricula and textbooks as controversial." The National Council for the Social Studies doesn't track data on how the attacks are taught in schools or their place in curricula. Neither does the National September 11 Memorial & Museum. But the museum says demand has gone way up for its professional development program for educators on teaching the subject. The organization has offered seven such sessions in the past two years and plans to expand in coming months "due to overwhelming response," says Communications Director Kate Monaghan. It also conducts a weeklong summer seminar for teachers called "9/11 and American Memory." Duckworth found that if Sept. 11 is addressed in classrooms, too often teachers don't want to tackle the complex, often ugly aftermath at home and globally: the wars in Iraq and Afghanistan; the Patriot Act and civil liberties; radical Islam and Islamophobia. "I think it's very disturbing," Duckworth says, "especially during this presidential election cycle. Islamophobia is just sort of free-floating out there in the air." If we don't address Sept. 11 in all its complexity, she says, stereotypes and misinformation will continue. A version of this story was published on NPR Ed in September 2016.